Handfasting has been a part of wedding history in the UK since medieval times. Traditionally a handfasting was the way in which couples showed their commitment to each other - a declaration of their intent to marry! Nowadays, we call this an engagement period and we symbolise it by wearing a ring. Back then, the couple's hands would be bound together with rope, ribbon, a sash or cord - so beginning the phrase... tying the knot! 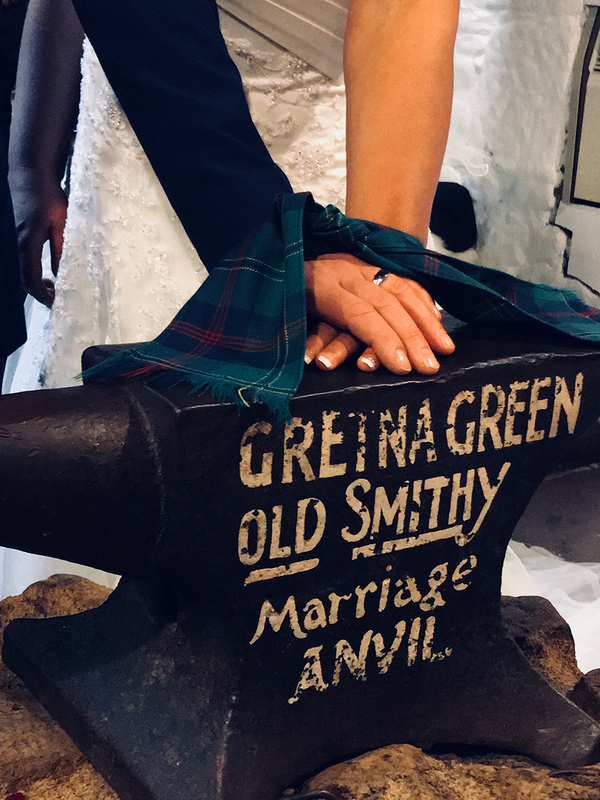 Here at Gretna Green, we offer handfasting for all types of occasions, whether you come to renew your wedding vows, celebrate your engagement or celebrate an important anniversary, or even just to show each other that you are committed, our Anvil Handfastings are a romantic and intimate ceremony; conducted by our Famous Blacksmiths Shop Guides. To book, please click 'Enquire Now' to contact us using the enquiry form below. Alternatively, you can call us on 01461 337893. Our office hours are 9am to 5.30pm, 7 days per week. How much does an Anvil Handfasting cost? The cost for a handfasting at Gretna Green is just $84.60 for our 'Unbreakable Thread' Silver Package and $128.80 for our 'Locked in Love' Gold Package. The ceremony will take place in one of our marriage rooms in The Famous Blacksmiths Shop or Gretna Hall Historic Marriage House. Is a handfasting a legal wedding? A handfasting is an informal ceremony, conducted by a Gretna Green Blacksmiths Guide - it is a traditional blessing and is not a legal marriage ceremony. You CAN add a handfasting to your wedding ceremony or official vow renewal ceremony too, if you like, but only a marriage conducted by a registrar or minister is a legal marriage.